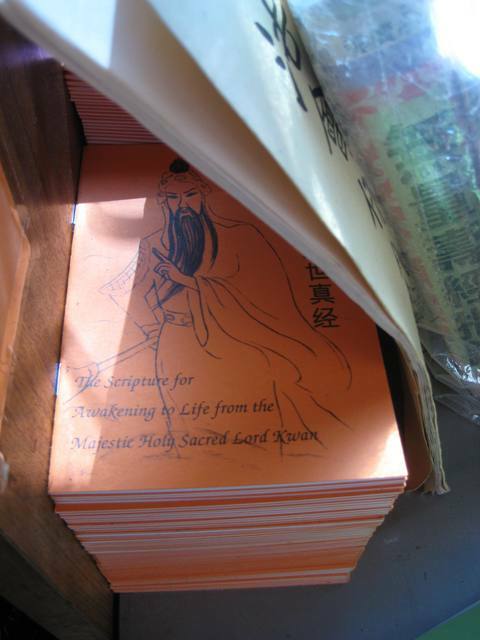 One of my more esoteric interests is in the literature left for free distribution at Buddhist temples. So great is this interest that I very nearly did my Honours Thesis on it - until common sense intervened. 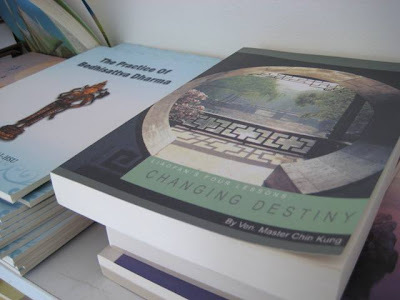 At almost every Buddhist temple you will find a crowded, untidy shelf or two of free literature. The distribution of religious literature and images is a very old part of Buddhist culture. To print such material and distribute it is seen as one of the best ways of cultivating good karma. In Thailand families will frequently print a religious book in memory of a recently deceased relative and distribute the book at the funeral, and then at temples afterwards. 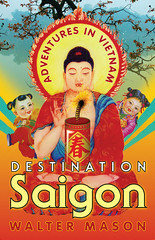 If you've travelled to Hong Kong or Taiwan you will know that these free books and pictures are seen everywhere. Indeed, the epicentre of freely distributed Buddhist material seems to be Taiwan, and it is the source of most free Buddhist material that you come across in Australia. 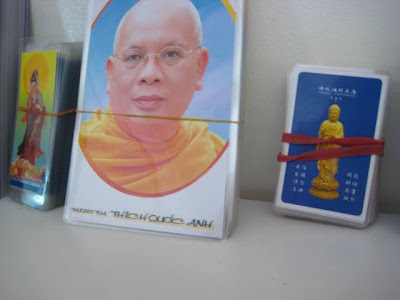 As well as books you also encounter small laminated cards featuring images of the Buddhas and Bodhisattvas and, less frequently, famous monks. These days, too, it is common to see audio CDs and DVDs of chanting, Buddhist music and recorded Dharma talks. Obviously this kind of media is much cheaper to produce than bound books, and it is also more accessible for older people, the less literate, or those who aren't inclined to read much. Interestingly, the material left at temples is frequently non-exclusive, and not necessarily Buddhist. I came across this pamphlet dedicacted to the worship of the folk-God Guan Di, and a lot of the other material available is produced by Buddhist sects who aren't necessarily in philosophical agreement with the individual temple. On occasion I even come across Christian literature, left there by hopeful missionaries! 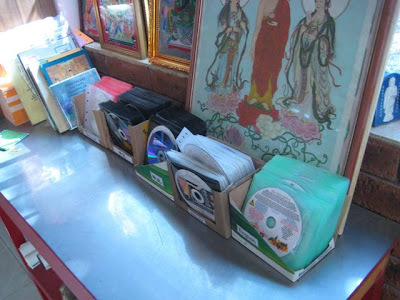 Some temples even distribute small machines that contain a digital recording of a Buddhist chant. 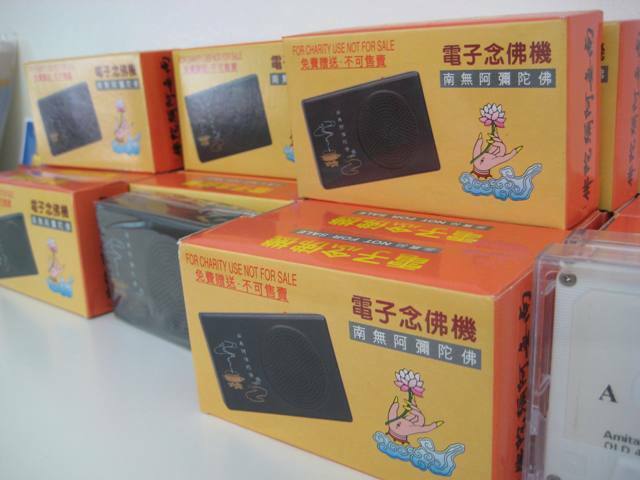 You can switch these on and leave them going all day, thereby having your prayers said for you. The ones on offer at this temple chant Amitabha Buddha's, Kwan Yin's and Sakyamuni's name. In Vietnamese or Chinese - your choice! I love this pic of me taken outside the Tay Ninh Cao Dai Cathedral in 1994. I am young, moderately beautiful (hey, somebody's gotta sing my praises) and quite fit. I had been desperate to visit Tay Ninh, having just read The Quiet American and already being fascinated by the religion of Cao Dai. I had to agitate quite a bit - my partner's family were hesitant to go all that way to see something they viewed as of no possible interest to a sophisticated foreigner. Eventually my mother-in-law relented and hired a car, and we drove out. My partner's father, a staunch fundamentalist Christian, refused to enter the place, convinced it was a haunt of the devil. My mother-in-law timidly peeped her head into the cathedral, but when she saw the viewing balconies that ran high up along the walls she declared the entire thing a death trap. She beseeched me not to go up there - she was certain she could see those balconies swaying. But of course I clambered up, and stayed for the duration of the midday prayers. 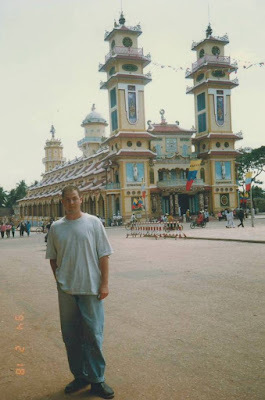 I had no way of knowing that in the future I would do this many, many times, and would come to know the quaint little city of Tay Ninh like the back of my hand.